For our second day in St. Kitts, we were treated to a tour around the island by Scenic Railway. This is the last railway in the West Indies. I was surprised that there was an a capella choir on the train! I loved the views and the entertainment. I would like to go back and explore the bat caves and the St. Kitts Eco park which reminds me– the airport on the island is run on solar power! Definitely plan to stop at Timothy Hill and take in the view–you can see where the Atlantic Ocean and the Caribbean Sea meet. Afterwards we explored the site for the Park Hyatt, the buildings will be three stories and you enter on level two and go up or down one flight of stairs–no elevator needed. There are many green energy choices being made on St. Kitts. After arriving into St. Kitts by the YU Lounge, we were aware that this was an island for Signature Luxury Experiences. Christophe Harbour will be home to 24 slips for super yachts. The Pavilion Beach Club is stunning and definitely matches the levels of elegance that we came to expect after the YU Lounge. I think we could have simply decided to never leave! But we managed to leave. We spent the afternoon snorkeling and swimming at Shipwreck Beach. We watched mongoose and monkeys, ate fresh fish and relaxed. You can also paddleboard here. It was great fun to swim with Kellee, Cathy and Bre and have a Go Pro/LGG4 photo shoot! Outdoor drinks at Ocean Terrace Inn were superb especially because of the gorgeous Caribbean sky. We loved dining at The Verandah. The Asian fusion cuisine included conch, lobster, shrimp, and beef. Chef Joemar is from the Philippines and he creates a magic chocolate cake that makes wishes come true! We finished our night at Vibes Beach Bar with drinks, dancing and a gathering of new friends. 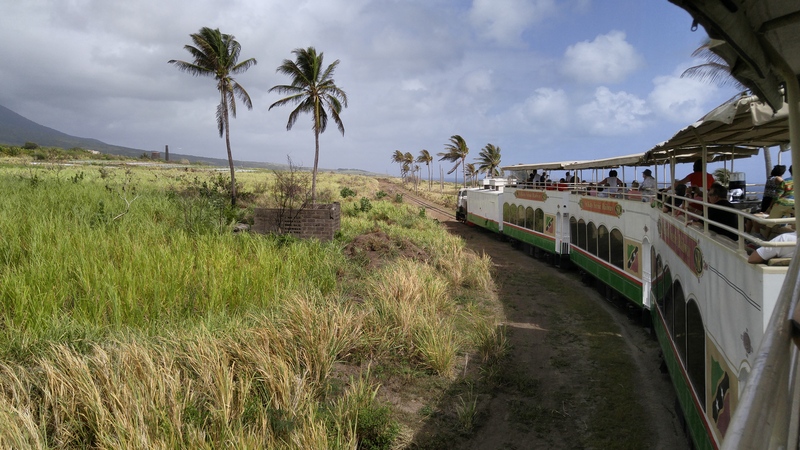 More about the St. Kitts Scenic Railway: “The narrow gauge St. Kitts Scenic Railway is one of the most beautiful train rides in the world. Originally built between 1912 and 1926 to deliver sugar cane from the fields to the sugar mill in Basseterre, the “Last Railway in the West Indies” now provides a fascinating way for visitors to see the island from the comfort of modern passenger train cars and sightseeing buses. The 18 miles by rail and 12 miles by bus make a complete 30-mile circle around the island. Duration: Approximately 2 hours by Rail and 45 minutes by Bus. Where were Lisa's Wonderful Wanderings in 2018?